Sandra (Levitt) and Jeff (Seif) talk about how Paul included us all in the Body of Christ and how he witnessed to Jew and non-Jew. Letters from viewers are reviewed. 01:07 OF THE 3 PART SERIES. 01:10 IN THE FOOTSTEPS OF THE RABBI FROM TARSUS. 01:15 AND THIS WEEK WE'RE GONNA TALK ABOUT HOW PAUL REALLY INCLUDES ALL OF US. 01:19 ALL OF US ARE SINNERS, NOT MAN, NOT WOMAN, NOT GREEK, NOT JEW, I LOVE IT. 01:22 YES IN THE FIRST SECTION WE LOOKED AT INTRUSION. 01:27 AND HERE WE'RE INTERESTED IN INCLUSION. 01:34 BUT HE WAS INVITING. 01:38 IN THE SAME PERSON. 01:52 AND THAT GOD FORGIVES OUR SINS, BECAUSE OF YESHUA. 01:57 SO HE FORGIVES US OF OUR SINS AND HE BRINGS US INTO A NEW FAMILY. 02:01 AND THE DOOR IS OPEN FOR ANYONE WHO WOULD REPENT. 02:07 THAT PEOPLE NEEDED TO REPENT. 02:15 IN THE NEW ECONOMY. 02:16 AND WHY WOULDN'T HE? 02:18 PAUL WAS THE FOREMOST OF SINNERS HIMSELF, WASN'T HE? 02:19 OH MY, OH MY GOODNESS. 02:21 SAT THERE WHILE STEPHEN WAS BEING STONED. 02:26 WENT OUT LOOKING FOR PEOPLE OF "THE WAY". 02:29 I LOVE THE NAME OF THAT. 02:30 THE NEW CHRISTIANS WERE CALLED, "THE WAY." 02:32 THAT'S RIGHT, HE LOOKED TO DESTROY "THE WAY." 02:38 FOR ALL PEOPLE NOT JUST JEWISH PEOPLE. 02:41 IF YOU'LL OPEN UP YOUR BIBLES PLEASE TO THE BOOK OF GALATIANS. 02:44 THIS IS ARGUABLY HIS FIRST WRITING. 02:48 WE'VE CONSIDERED HIS MOVEMENTS PREVIOUSLY. 02:50 WE'LL CONSIDER HIS WRITINGS IN A COUPLE OF WEEKS, BUT HERE JUST TO TAP INTO A CORE VALUE OF HIS. 03:22 THE ANCIENT WORLD WAS VERY STRATIFIED. 03:25 THERE WERE THE HAVES, THE HAVES NOTS. 03:27 YOU WERE BORN INTO A SOCIAL CLASS AND THERE YOU REMAINED. 03:30 IT SEEMS THAT THE HIERARCHAL PYRAMID COLLAPSES. 03:40 ARE NOW ABLE TO LOCK ARMS WITH THOSE THAT ARE OF A HIGHER ILK. 03:45 GOOD NEW FOR ALL OF "YOUS," CORRECT? 03:47 THAT'S WHAT'S SO WONDERFUL ABOUT PAUL. 03:52 HE MAKES IT THAT WE ARE ALL SINNERS. 03:54 AND THAT, I CAN'T STRESS THAT ENOUGH. 04:01 BY AIRPLANES FLYING INTO TOWERS, OUR COUNTRIES IN TUMULT. 04:09 I'M OF JEWISH EXTRACT. 04:17 BY ENEMIES THAT ARE OF AN ISLAMIC PERSUASION. 04:20 AND THEN I THINK OF AHMADINEJAD AND OTHERS WITH NUCLEAR CAPABILITIES. 04:26 AND I ADMIT THAT I'M TENSE AND I'M SET ON EDGE. 04:34 DO I NEED TO FIND A WAY TO MAKE ROOM FOR ALL PEOPLE IN MY WORLD? 04:38 I THINK WHAT PAUL IS SAYING, IT'S NOT ABOUT THAT. 04:42 IT'S ABOUT US BEING INDIVIDUALLY BEING SINNERS. 04:45 DO I NEED TO MAKE ROOM FOR PEOPLE IN MY LIFE? 04:47 YES I THINK WE NEED TO WITNESS. 04:49 I THINK WE NEED TO TALK TO PEOPLE ABOUT THE BELIEFS THAT WE HAVE. 04:52 BUT I'M LIKE YOU. 04:58 IF YOU WANNA CALL THEM RADICALS. 04:59 I DON'T THINK THEY'RE RADICALS. 05:02 THEY ARE SUPPOSE TO EITHER KILL US OR CONVERT US. 05:05 AND I THINK THAT'S THEIR AGENDA. 05:08 AND I TOO, IT'S A KNEE JERK REACTION. 05:13 I'M LOOKING FOR SOMEBODY THAT LOOKS SUSPICIOUS. 05:16 AND CALL IT PROFILING, I DON'T CARE. 05:18 I AM TERRIFIED OF WHAT THESE PEOPLE CAN DO. 05:21 INCLUDE 'EM, I'D LIKE TO WITNESS TO THEM. 05:24 I DON'T KNOW IF I WANNA INCLUDE THEM IN EVERYTHING I DO. 05:33 BUT THERE'S A CERTAIN PERCENTAGE THAT ARE AND THERE'S A THREAT THERE. 05:36 BUT STILL ARE WE BETTER TO BE THE KIND OF PEOPLE THAT TRIES TO MAKE ROOM FOR PEOPLE? 05:41 PAUL OPTS FOR A NONE DISCRIMINATORY POLICY. 05:46 OF COURSE THIS IS FOR PEOPLE THAT COME INTO THE CHURCH. 05:49 THAT WE ALL REPENT OF OUR SINS AND BECOME A PART OF THIS NEW FELLOWSHIP. 06:00 AND BE OPEN TO ALL PEOPLE FOR AS MUCH AS POSSIBLE? 06:05 IS THERE NOT AN ELEMENT OF EVIL THAT WE HAVE TO BE AWARE OF? 06:09 THE BIBLE TEACH US THAT EVIL BRINGS GOOD DOWN? 06:12 ARE WE SUPPOSE TO BE AWARE OF WHO WE ARE AND WHAT WE STAND FOR? 06:20 WWW.LEVITT.COM IS WHERE YOU'LL GO TO GET IT. 06:32 "WISE AS A SERPENT." 06:34 JESUS SAID THAT WE NEED TO BE WISE AS A SERPENT AND INNOCENT AS A DOVE. 06:40 I THINK WE DO NEED TO BE SOMEWHAT CAUTIOUS IN THE WORLD AT LARGE, BUT IN THE CHURCH. 06:45 BUT IN THE CHURCH IS A WHOLE NOTHER STORY. 06:51 OR I'VE BEEN SOME PLACE OUT, I KNOW A BELIEVER WHEN I SEE A BELIEVER. 07:00 IN THEORY NOT ALWAYS IN PRACTICE. 07:05 TRYING TO RIP OFF OLD WOUNDS, BUT I'LL NEVER LET A BLACK PERSON IN THIS CHURCH. 07:08 THAT IS JUST ABSOLUTELY PATHETIC. 07:11 I MEAN PAUL WOULD TURN OVER IN HIS GRAVE. >>NO, A BELIEVER IS A BELIEVER. 07:15 HE'S TALKING ABOUT JEWS, HE'S TALKING ABOUT OTHER BELIEVERS. 07:18 HE'S NOT TALKING ABOUT PEOPLE THAT REALLY COME TO BE BELIEVERS. 07:37 BECAUSE JESUS MADE ROOM FOR YOU IN HIS. 07:40 WHEN HE WAS ON THE CROSS, HE SAID, "FATHER FORGIVE THEM FOR THEY KNOW NOT WHAT THEY DO." 08:00 YOU CAN HAVE A NEW START IN LIFE. 08:01 BACK IN A MOMENT. 08:20 ASK FOR OUR FREE MONTHLY NEWSLETTER THE LEVITT LETTER. 08:23 WHEN YOU CALL, BE SURE TO ALSO ASK FOR OUR FREE CATALOGUE WITH LATEST VIDEOS, BOOKS, AND MUSIC. 08:33 READING PACKETS, TEACHING CDs, AND MAIL IN TESTS. 08:37 YOU MAY WANNA JOIN US ON AN UPCOMING TOUR OF ISRAEL AND PETRA. 08:40 OR CRUISE THE MEDITERRANEAN, VISITING GREECE AND EPHESUS. 08:49 THE GREEKS HAVE A SAYING, "FIVE SENSES TO A DOOR, ONE COUNTRY TO EXPLORE." 08:54 JEFF WE'RE EXPLORING GREECE. 08:55 WE'RE STANDING HERE IN CORINTH, IT'S JUST BEAUTIFUL. 08:58 I WANT EVERYONE TO COME SEE IT. 08:59 WELL YOU HEARD WHAT THE LADY SAID. 09:01 COME TO CORINTH AND WALK IN PAUL'S FOOTSTEPS. 09:04 IT'S A GOOD EXPERIENCE, ISN'T IT? 09:05 IT WOULD BE OUR PLEASURE TO SHOW YOU GREECE. 09:08 ALL THE BIBLE SITES COME ALIVE WHEN YOU SEE THEM IN PERSON. 09:12 JEFF THEY COME ALIVE. 09:13 I'M SO EXCITED TO SHOW PEOPLE GREECE AND ISRAEL. 09:17 YES, YOU'LL LOVE IT. 09:19 IT'LL BE INFORMATIONAL, INSPIRATIONAL. 09:25 AND WALK IN THE BIBLE LANDS. 09:29 WE LOOK AT GREECE AGAIN. 09:32 I DON'T KNOW THAT I CAN LOOK AT IT TOO MANY TIMES. 09:34 I LOVE TAKING YOU TO GREECE. 09:35 JEFF LOVES TAKING YOU TO GREECE. 09:37 WE WOULD LOVE TO TAKE YOU TO GREECE, TO ISRAEL, TO JORDAN WITH US. 09:41 WE WOULD LOVE TO SHOW YOU THE FOOTSTEPS OF PAUL. 09:44 WE'D LOVE TO SHOW YOU THE BIBLE AND LET IT COME ALIVE FOR YOU. 09:57 WHERE PEOPLE CAME AND TOOK COURSES. 10:03 AS HE MADE HIS WAY ABOUT THE ROMAN EMPIRE. 10:06 ADVANCING FOR ISRAEL'S MESSIAH. 10:11 THAT WERE TRAVELING ABOUT WITH HIM. 10:14 WHAT IS THE FIRST THING HE DID WHEN HE WENT TO A TOWN? 10:16 HE WENT INTO A SYNAGOGUE. 10:17 THEY WELCOMED HIM IN BECAUSE HE HAD ON WHAT? 10:21 THEY KNEW HE WAS A JEW. 10:22 THEY WERE EXCITED TO HEAR WHAT HE HAD TO SAY. 10:29 AT WHAT HE HAD TO SAY. 10:30 BUT STILL HE TAUGHT. 10:40 WHO BECAME THE NUCLEUS OF THIS NEW COMMUNITY. 10:43 WELL AND THEY ASKED HIM TO COME BACK. 10:47 OH WE WANNA HEAR MORE, WE WANNA HEAR MORE? 10:49 THERE WERE BELIEVERS WHO BELIEVED. 10:53 THAT WOMEN SEEM TO FACTOR SIGNIFICANT IN PAUL'S WORLD. 10:57 LUKE TELLS US THERE WERE LEADING WOMEN WHO PARTICIPATED. 11:09 IN THIS MANS WORLD. 11:11 I'M THINKING YOU'RE RIGHT. 11:21 AND HOW CAN I MAKE MY LIFE BETTER? 11:23 AND PAUL LAYS IT OUT. 11:28 THIS IS WHAT YOU'VE BEEN LOOKING FOR. 11:30 HE'S COME AND NOW WE NEED TO FOLLOW. 11:32 IT SEEMS TO ME THAT HUMANS BEING STRATIFY. 11:35 THAT THERE'S, WE GRADE PEOPLE, WE VALUE PEOPLE, YOU'RE A TEN, YOU'RE A NINE. 11:45 AND THERE'S THE HAVES AND THE HAVES NOTS, BUT PAUL COLLAPSES ALL OF THAT. 11:55 AND THAT IT'S NOT JUST HIS WORLD, BUT RATHER IT'S THE MESSIANIC KINGDOM. 11:59 BUT IT'S A FREEDOM. 12:00 I THINK HE'S TEACHING ALSO OF A FREEDOM. 12:08 BUT IT'S THE FREEDOM THAT YOU HAVE IN MESSIAH. 12:11 I THINK THAT'S WHAT THEY SAW. 12:13 I THINK THEY SEE AS YOU SAID, THEY ARE A NEW CREATION. 12:15 I THINK THEY SEE THAT NEW CREATION IN HIM. 12:17 SO WOMEN AND MEN, JEWS AND NON JEWS, AND THE RICH AND POOR. 12:22 SPEAKING OF FREEDOM PAUL'S WRITING A LETTER AND WE'RE GONNA LOOK AT THIS. 12:28 WHERE HE ADVOCATES FOR THE FREEING OF THE SLAVES. >>THAT'S RIGHT. 12:34 PAUL TAKES IT VERY SERIOUSLY. 12:44 THEY WERE TO BE KILLED. 12:47 THERE'S FREEDOM IN BEING A SLAVE. 12:50 THERE IS FREEDOM IN FORGIVING THIS GUY. 12:53 IT SEEMS TO ME THAT PAUL WAS A RADICAL. 12:57 I CAN UNDERSTAND WHY THEY CUT HIS HEAD OFF. 13:03 THESE ARE HUMAN BEINGS, THIS ISN'T YOUR PROPERTY, THIS IS YOUR BROTHER. 13:06 PEOPLE DON'T ABIDE THAT. 13:12 LISTEN YOU'RE TO SERVE ONE ANOTHER. 13:18 PAUL SAID YOU'RE BOTH LIVING IN SIN FOR THAT ARROGANCE. 13:24 AND PAUL IS SAYING, THERE IS NO POSITION. 13:27 WE ARE ALL EQUAL AT THE CROSS. 13:29 AND I THINK THAT'S GREAT. 13:35 WE LIVE IN A WORLD TODAY WHERE SOME HAVE AN AGENDA TO MAKE PAUL OUT TO BE A SEXIST AND A RACIST. 13:40 IT'S STRIKING THE WAY SECULAR CULTURE ATTACKS BIBLICAL VISION. 13:57 THAT HE'S ADVOCATING FOR EQUALITY AMONGST PEOPLE. 14:01 PAUL MADE ROOM FOR PEOPLE IN HIS WORLD. 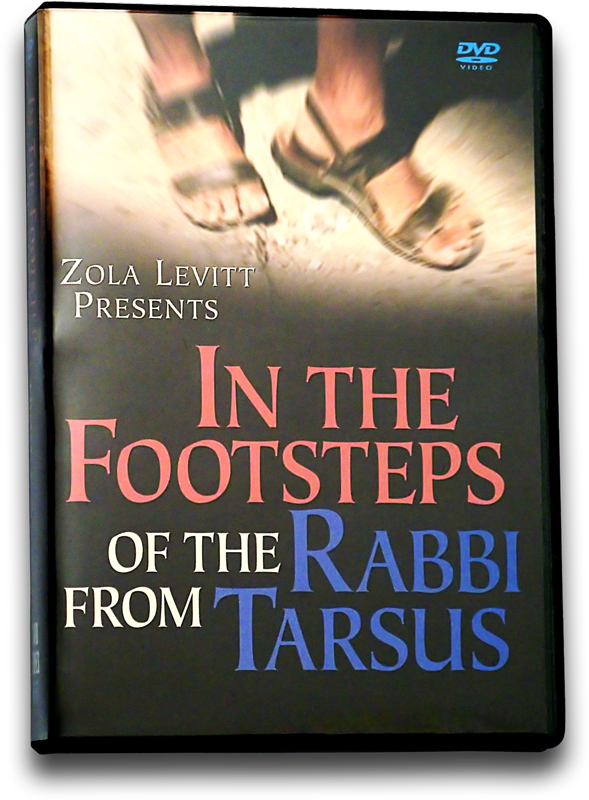 14:09 TO DEVELOP FOR YOU A SERIES ENTITLED, "IN THE FOOTSTEPS OF THE RABBI FROM TARSUS." 14:18 "IN THE FOOTSTEPS OF THE RABBI FROM TARSUS." 14:38 WE HAVE IT THERE FOR YOU TO LEARN ABOUT THIS INCLUSIVE RABBI. 14:42 THIS JEW WHO LOVED ALL OF YOU NAMED, PAUL. 14:55 AND THAT'S SOMETHING THAT I'M PROUD TO KEEP ON, KEEPING ON WITH WHAT HE STARTED. 15:01 YES WE DON'T WANNA MAKE MONEY AN OBJECT. 15:06 TO GET INFORMATION TO YOU IF YOU WANT IT. 15:11 BUY AGAIN WE HAVE IT THROUGH OUR MAGAZINE, "THE LEVITT LETTER." 15:16 IT'S ALL ABOUT JEWS IN THE NEWS AND IT'S STUFF YOU CAN USE. 15:18 WE'RE LOOKING AT STORIES THERE THAT RESONATE. 15:22 THEY TALK ABOUT WHAT'S HAPPENING IN THE WORLD. 15:24 THEY GIVE INSIGHTS INTO THE WORD AND IT'S YOURS FOR THE ASKING. 15:30 BUT WE WANNA GET THIS TO YOU. 15:32 WELL AND THE BOOK IS WONDERFUL. 15:34 THE BOOK,"IN THE FOOTSTEPS OF THE RABBI FROM TARSUS." 15:37 IT IS A MUST READ FOR ALL OF YOU. 15:38 I JUST HIGHLY RECOMMEND IT. 15:43 BUT YOU KNOW THE MUST READ BOOK IS THE BIBLE ITSELF. 15:46 I AGREE AND THAT'S WHERE IT ALL COMES FROM. 15:49 TO GET A JEWISH VIEW ON THE LITERATURE. 15:58 IF YOU'RE A BAPTIST HE'S BROTHER PAUL OR WHATEVER. 16:04 BECAUSE IT UNDERSCORES THE FACT THIS IS A JEWISH MAN WHO CAME TO FAITH. 16:09 AND WE'D LOVE TO BLESS YOU BY GIVING YOU THAT PERSPECTIVE. 16:14 THAT THIS JEWISH RABBI WANTED THE WHOLE WORLD TO PARTICIPATE. 16:20 HOW DOES THAT RESONATE WITH YOU? 16:24 AND TO TELL PEOPLE THIS IS THE MESSIAH? 16:32 BUT HE TAUGHT THEM WHAT THEY NEEDED TO KNOW. 16:34 WE'RE GONNA GO TO, LISTEN TO SOME OF ZOLA'S MUSIC. 16:39 HE DOES A WONDERFUL JOB WITH PUTTING THE MUSIC AND THE SCENES TOGETHER. 16:43 AND YOU'LL SEE SOME OF GREECE. 16:44 I THINK YOU'LL LIKE THIS. 18:09 THAT WAS ZOLA'S MUSIC. 18:10 I ENJOYED IT, I KNOW YOU DID TOO. 18:12 WE'RE LOOKING AT ALSO SCENES IN CORINTH. 18:14 CORINTH IS A WONDERFUL HISTORICAL PLACE THAT WE GO TO ON THE TOUR. 18:18 AGAIN JEFF AND I ADVISE YOU TO COME ON THE TOUR. 18:20 BUT SPEAKING OF A TOURS, I WANNA TALK ABOUT LETTERS. 18:25 WE GOT A COUPLE I REALLY WANNA TALK ABOUT. 18:40 THAT'S A GREAT OBSERVATION. 18:50 AND THERE'S FERMENTING ANTI-ROMAN DISCONTENT BREWING THERE. 18:54 AND THEY'RE ALL PART AND PARTIAL TO THEIR CULTURE. 19:01 HE WAS FROM TARSUS, IT WAS A UNIVERSITY CITY. 19:04 HE WAS VERY OPEN. 19:08 AND ENABLED HIM TO BE MORE VERSATILE AND MORE OPEN TO OTHERS. 19:15 AND TO A JEW I BECAME A JEW." 19:16 HE WAS AS YOU SAY BENDABLE, HE DID NOT BREAK. 19:18 YES HE WAS WIRED LIKE THAT. 19:22 "BLESSED ARE THE FLEXIBLE, THE WILL NOT BE BROKEN." 19:31 THEY GET ALL NASTY WITH YOU. 19:33 I DON'T THINK PAUL WAS LIKE THAT. 19:35 PAUL FOUGHT FOR CORE PRINCIPALS. 19:41 AND ABLE TO REACH SO MANY PEOPLE BECAUSE OF IT. 19:49 THIS IS WHAT YOU NEED TO DO. 19:51 IT'S OK TO BELIEVE THIS WAY, THE RAPTURE HAS NOT COME. 19:57 IN GETTING THIS RELIGION GOING. 20:05 BECAUSE HE WASN'T WITH JESUS. 20:08 HE NO EXPERIENCE. >>FAITH. 20:13 AND HE DID CHECK IN WITH THE DISCIPLES AND GET SOME TUTELAGE. 20:21 THAT ARE MORE OPEN TO OTHERS, AS APPOSED TO BEING NARROW. 20:24 AND PAUL MODELED THAT. 20:26 HE DID, HE WAS WONDERFUL. 20:31 AND THAT'S THE TRUTH, THE BATTLE IS NOT OURS, IT IS GOD'S BATTLE. 20:36 IF WE CAN BE MORE BROADLY CONSTITUTED. 20:50 OH, I LOVE IT. 20:57 BUT THEN HE TAKES US TO TASK AND HE'S NOT A HAPPY CAMPER. >>WHY? 21:05 SUNDAY'S NOT THE DAY, SATURDAY IT IS. 21:07 CHRISTIANS GO TO CHURCH ON THE WRONG DAY, THE WRONG HOLIDAYS. 21:22 THAT ZOLA USE TO ALWAYS DRESS UP FOR CHRISTMAS. 21:27 TO KINDA BUY INTO THAT PAGAN HOLIDAY. 21:30 AND ZOLA TRIED TO BE AS FRIENDLY AS HE COULD TO THE REGNANT CULTURE. 21:35 BUT THIS PERSON BELIEVES THAT WE'RE SELLING OUT TO THE DEVIL. 21:40 I GUESS I JUST DON'T EVEN BELIEVE THIS. 21:42 IT'S OK TO CELEBRATE THE HOLIDAYS. 21:47 WE CELEBRATE THOSE HOLIDAYS. 21:48 I MEAN I'M ALMOST AT A LOST FOR WORDS. 21:56 IT'S NOT GONNA MEAN MY SALVATION'S IN ANY PERIL AT ALL. 22:07 AND THEY HEAR US TEACH ABOUT THE JEWISH ROOTS OF THE FAITH. 22:20 WE'RE JUST HOPPING IN BED WITH THE DEVIL. 22:21 BECAUSE WE SHOULD BE RESISTING AND TELLING THE WORLD NO. 22:25 NO MY MESSAGE TO THE WORLD LIKE PAUL AND HEAR ME ON THIS IS, LET'S NOT MAJOR ON MINORS. 22:33 DO I PERSONALLY BELIEVE THAT JESUS WAS BORN ON DECEMBER THE 25TH? 22:38 NO, BUT I'M GLAD TO REMEMBER JESUS' ENTRANCE INTO THE WORLD. 22:43 DO I PARTICULARLY BELIEVE THAT JESUS ROSE ON WHAT WE CALL EASTER SUNDAY? 22:47 HEY LISTEN, I'M GLAD TO HAVE A POINT IN THE CULTURE TO TALK ABOUT THE RESURRECTION. 22:53 FIRST FRUITS. >>FIRST FRUITS. 22:55 FIRST FRUITS, LET'S CALL THE REAL NAME. 23:01 BUT TO MY WAY OF THINKING, I BELIEVE THAT WE JUST HAVE TO BE MODERATE. 23:10 IT'S NOT AN ISSUE FOR ME. 23:12 THE ISSUE IS NOT THE ISSUE. 23:13 WHAT IS THE ISSUE THAT SOMEBODY WORSHIPS ON SUNDAY? 23:15 OK, PAUL REALLY SAID WE SHOULD WORSHIP EVERYDAY. 23:22 WE'RE SUPPOSE TO BE WORSHIPPING EVERY SINGLE DAY. 23:24 SO THIS IS JUST NOT AN ISSUE. 23:25 THE HOLIDAYS ARE JUST A PICTURE OF MESSIAH. 23:30 AND THE SYMBOLISM OF MESSIAH IN THESE HOLIDAYS? 23:32 I THINK THOSE ARE WONDERFUL. 23:48 WOULD BE THROUGH, NOW HEAR ME ON THIS, LEARNING ABOUT THE SEVEN FEASTS OF ISRAEL. 23:54 I KNOW SOME OF YOU'VE NEVER HEARD THAT BEFORE. 23:56 OUR FOUNDER ZOLA LEVITT WROTE A BOOK, "THE SEVEN FEASTS OF ISRAEL," AS HAVE OTHERS. 24:01 OH, WHAT A PIECE? 24:19 THE OUTPOURING OF THE HOLY SPIRIT COINCIDES PERFECTLY. 24:22 AND WHAT'S COMING NEXT? 24:25 THE TRUMPETS AMEN >>THE FEAST OF TRUMPETS, THE RAPTURE. 24:27 I MEAN, IT IS TRUE THAT THE BEST WAY TO REALLY SEE JESUS ARE THROUGH THE FEASTS OF THE BIBLE. 24:33 NOT THROUGH THESE LATER MADE FEASTS. 24:37 LET'S GET THAT, MOST OF THEM PAGAN FEASTS. 24:44 IT'S NOT GONNA HURT MY SALVATION. 24:46 IF I CELEBRATE CHRISTMAS, IT'S JUST NOT. 24:51 I'M GRATEFUL THAT I CAN CELEBRATE HIS BIRTH. 24:55 IS COMING TO YOU IN THE EASTER SEASON YOU MIGHT RECALL. 25:01 YOU MIGHT RECALL THE STORY OF THE WOMAN AT THE WELL. 25:05 HOW DO WE WORSHIP, IS IT ON THIS MOUNTAIN OR ON THAT MOUNTAIN? 25:10 HOW DO WE DO THIS THING? 25:18 IN SPIRIT AND IN TRUTH. 25:24 I'M GLAD THAT PEOPLE ARE WORSHIPPING YESHUA IN SPIRIT. 25:32 PEOPLE ARE REALLY BLOWN AWAY BY HOW JEWISH THE CHRISTIAN RELIGION IS. 25:38 THEY'RE JUST REALLY, IT MAKES EVERY THING COME TOGETHER FOR THEM IN THE BIBLE, IT'S GREAT. 25:54 LET ME TAKE YOU TO A LETTER FROM SOMEONE OF THE FORGOTTEN PEOPLE. 26:06 BECAUSE I'M NOT MESSIANIC, HE SAYS, I'M JEWISH. 26:09 AND THIS PERSON'S IN PRISON AND HE HAD CONTACTED US TO RECEIVE SOME OF OUR INFORMATION. 26:29 AND HE GOES ON HERE. 26:36 WE NEED TO REMEMBER THE FORGOTTEN PEOPLE. 26:40 CERTAINLY THE JEWISH PEOPLE. 26:41 THERE'S NOT TOO MANY PEOPLE IN PRISONS. 26:45 THERE'S NOT THAT MANY JEWISH PEOPLE IN PRISONS. 26:48 AND SOMEONE WITNESSED TO HIM. 26:51 OUR MINISTRY GOES INTO THE PRISONS. 26:54 PEOPLE DON'T HAVE MUCH TO DO EXCEPT TO READ AND WRITE AND WATCH TELEVISION ON OCCASION. 27:00 AND PEOPLE WATCH OUR PROGRAM AND THEY READ OUR LEVITT LETTER. 27:05 FOR THOSE OF YOU THAT ARE IN PRISON, JEW, NON-JEW, BLACK, WHITE, HISPANIC, I DON'T CARE. 27:15 WE CONSIDER IT A PRIVILEGE TO GET OUR INFORMATION TO YOU. 27:22 THE POST OFFICE BOX APPEARS ON THE SCREEN AS WELL. 27:26 AND IF YOU WANNA HEAR FROM US, WE WANNA SPEAK TO YOU. 27:29 PAUL WAS VERY INCLUSIVE. 27:31 WE'RE ALL GUILTY AS CHARGED, EVERYONE OF US. 27:33 MYSELF, SANDRA, WE'RE ALL SINNERS SAVED BY GRACE. 27:41 YOU'VE COME TO IT YOUR WAY. 27:43 AT THE END OF THE DAY I DON'T SEE A WHOLE LOT OF DIFFERENCE. 27:50 NEXT WEEK WE'LL HAVE SOME MORE LETTERS. 27:51 WE'RE GONNA TALK SOME MORE ABOUT PAUL. 27:55 PRAY FOR THE PEACE OF JERUSALEM.